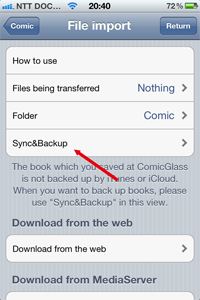 Files saved in ComicGlass cannot be backed up using iTunes or iCloud. Please backup any necessary files using the backup function provided within ComicGlass. Install and start up the ComicGlass BackupServer on your computer. After starting up the ComicGlass SyncServer, tap on the Download button within the ComicGlass toolbar. On the File Import screen, tap on 'Sync&Backup'. 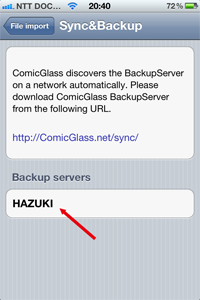 Any ComicGlass BackupServers on the network will automatically be detected. Tap on the server you wish to connect to. In the event that no Host appears, check your Network Settings. "Backup"...Backs up any books and settings saved in ComicGlass to your computer. 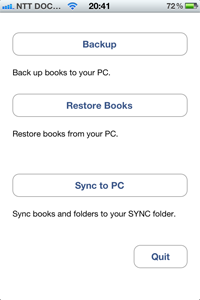 "Restore"...Restores any backed up books and settings in ComicGlass. Pre-existing files in ComicGlass will not be deleted. "Sync"....Transfers the contents of your computer's Sync folder to ComicGlass. Pre-existing files in ComicGlass will not be deleted.